This description needs a rewrite as the full spur from the loop of the Maricopa Trail. Parked at the Bulldog Canyon Usery Pass TH. The entrance to the new Maricopa County Trail - Usery Spur is located at the South East corner of the dirt parking lot. I try to stay away from parking on North East side due to the amount of nails that I have found due to people bringing pallets out and burning them for camp fires. This trail is smooth and mostly free of rocks. It's a great trail for bikes and trail runners. I went up to the intersection of the Pass Mountain Loop Trail and turned around. This would make a great route up to Pass Mountain Saddle. Then return to get some miles in and forget about the rocks on the South and East side of Pass Mountain Loop Trail. 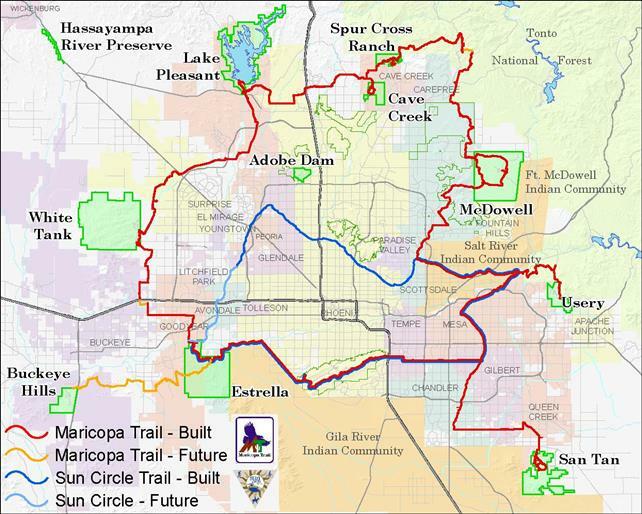 Will be interesting when they complete the whole Maricopa Trail Loop totaling 242 miles. Maybe I should get a head start and hike the trails that they have finished, would be a good project. From US 60 Take Ellsworth Rd. North and continue on Usery Mtn. Rd. Parking is 1.6 miles North of Usery Mountain Regional Park, or 3/10th of a mile North of Mile Marker 22. It's a dirt lot on the East side of the road.